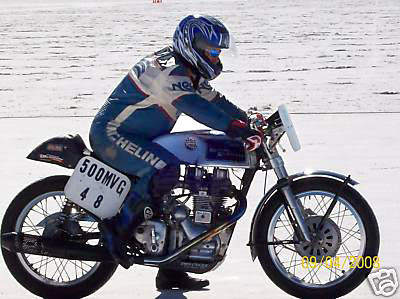 Dan Holmes' own video account of the land speed record attempt at the Bonneville Salt Flats is available on eBay. The 2008 run for the record pitted his team of Royal Enfield enthusiasts and only 500cc of power against the clock. They did not come away empty-handed. Holmes and his team raced in what is simultaneously one of the most forbidding, beautiful and respected (for speed) landscapes in the world. As time passes with no announcement of a renewed effort by this team in 2009, last year's run may be the one for the history books. The video is priced at $20, with free shipping.